I bought these in 2004, which means they have gone through everyone so far. They are still in great shape, except for the toe peeper holes. 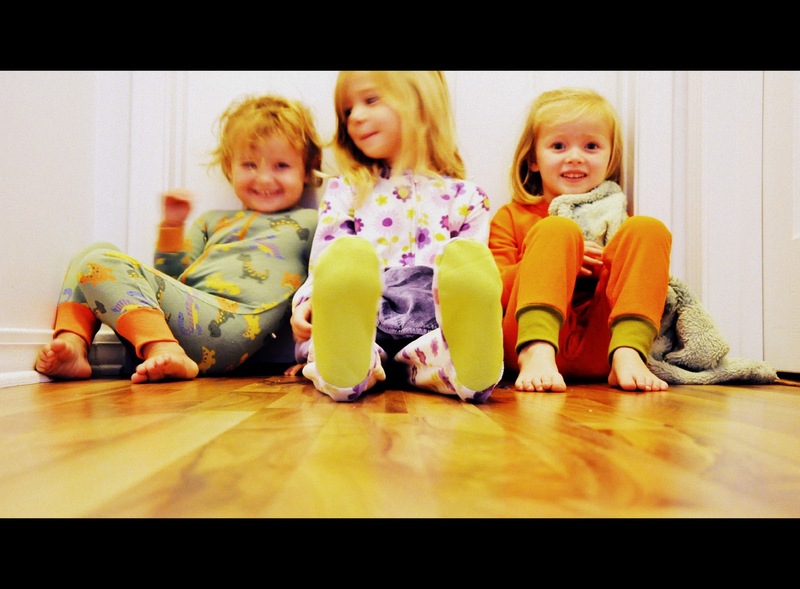 Many of our footed pajamas have the same or similar problems. I was going to toss them but couldn't bring myself to do it. So, as I was working on the Billy Cardi, I had a thought with that ribbed knit in my fingers. I bought a yard of the cream at $9/yard and then used a 50% off coupon, with intentions of using it for any future toe peepers on parade. I have boxes of RIT die from previous projects [and let's be frank, future projects as well]. I only died the pieces for this project so I can use the rest of the knit for others. Start by cutting the offending part off as low as possible. On the orange jammies I also cut off some additional elastic. On a size 24 mo I cut a piece 5" X 6". The width will be the circumference of the leg opening. Do not add an additional seam allowance, as you do want the cuff slightly smaller than the leg opening. The length is your preference, doubled since we will be folding it in half [do add a seam allowance on the length, for example: You want a finished cuff of 2", double it to 4" and add 1/2" on each side for a total of 5"]. Fold on the grain [or the width] in half and stitch 1/2". Hold seam allowance open and fold the tube in half, keeping the seams kissing. Pin the seam to the inside seam of the leg, right sides together. Pin the opposite side [find the middle by folding in half] to the other leg seam. There will be scrunching. THIS IS DESIRED. Stretch the extra fabric as you stitch. Stitch with a very slight zig-zag stitch so your stitching line won't break when that little foot slides through. Another pair to which I was going to add a cuff didn't have holes in the toes as it was very nicely reinforced with a double layer of fleece, but was horribly spooky on the foot. I just cut right along the seam [just the bottom fabric]. I cut two new pieces out of some cotton twill. Turn the jammies inside out and pin, sewing along the previous stitching line. You could add some puffy paint to the soles [or diamonds] for some non-slip protection. But where would be the fun in that? Isn't that the point of footie jammies, to slip and slide around? great idea ! thanks for sharing !!! My Mom used to add ribbing to everything of ours when we were little. 5 of us, too. wow, i would have thought those were my kids j's. im going to have to give that a shot, thanks! Way to be frugal! I actually would LOVE some footie jamies for myself but alas, they don't make them for 8.5 month pregnant women. Katy, this is such a great idea! Jammies can be expensive and this is a great way to fit the problem. You are so creative! Love it! I do something similar when I want to keep tights a bit longer, turning them into leggings. Their little legs just look so darn cute in them! yay for fixing footie jammies! Great idea--you are so smart! I just cut the feet off below the seam, and they're fine...for a while. So clever! Love baby jammies. ever since I started sewing, I have a hard time getting rid of any clothing that isn't stained. Upside? Someday I will make a fabulous quilt. Downside? I am running out of room in my house to store it all. Adore it!!! I love re-dos! WOW! Great save! And who doesn't love footie pjs? Do you know they still make them for us big people too, though they can be hard to find. Miss Smarty Pants, you are! What a cute pictures! Love what you did! I so needed this tutorial! I just have 2 girls but by the time the 1st is done with them the feet are in horrid shape. I think this is my weekend project! Wow! How creative!! I wish I could sew like that! After three girls going through the same jammies, it seems that every day I'm seeing my youngest's toes sticking out! I've got 5 pair to fix up already. Thanks so much for sharing!